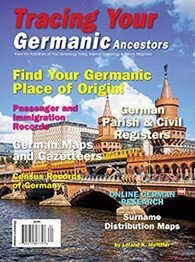 Tracing Your Germanic Ancestors; by Leland K. Meitzler from the Publishers of Your Genealogy Today, Internet Genealogy & History Magazine; 2016; 8.5x11; 66 pp; Item #: MM024-pdf; PDF downloadable eBook, Downloads are available immediately upon placing order. This book is also available in Printed format. Find Your Germanic Place of Origin! Note that there are no shipping charges on this item, as it is a PDF download. Upon placing your order, you will be able to download the PDF eBook directly from the FRPC screen. You will also be sent an email from where you can click on the link and download the item. You can only download the PDF eBook once, so if you make your order from a computer other than your own, you might want to wait until you get to your computer and do the actual download from the email.